Following it’s Bram Stoker award win earlier this year, Stephen Jones’, The Art of Horror: An Illustrated History, has received an award at the World Fantasy Convention. The awards were presented on the during this years convention in Columbus, Ohio at the World Fantasy Awards banquet. Awards ranged from lifetime achievement to various aspects of art and literature. Since it’s beginnings in 1975, The World Fantasy Convention has continued as an annual gathering and reunion of professionals, collectors, and others interested in the field of light and dark fantasy art and literature. The Art of Horror was nominated in the category the Special – Professional category. 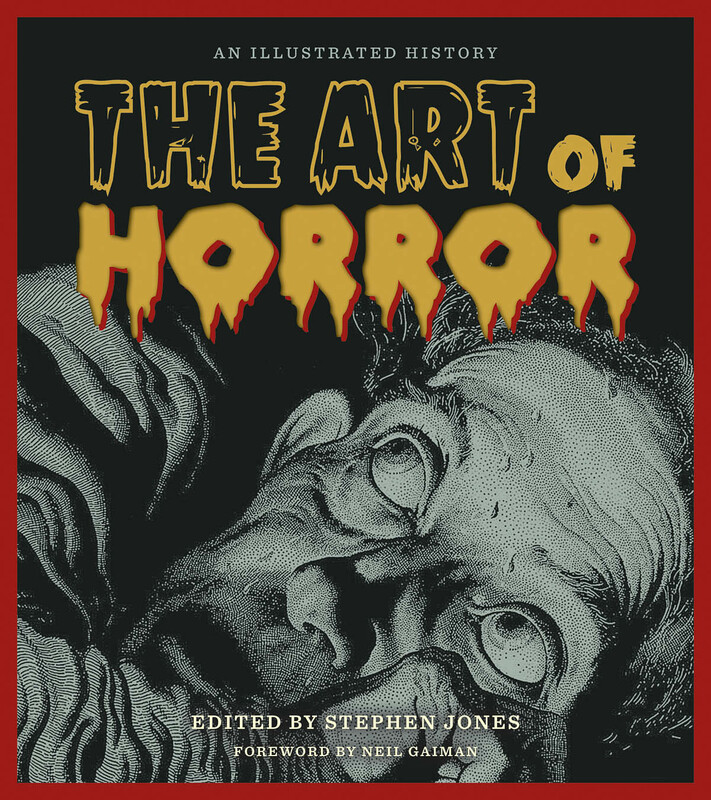 In The Art of Horror: An Illustrated History multi-award winning horror and dark fantasy writer and editor Stephen Jones brings together thrilling visuals of the horror genre that have bewitched audiences since the 19th century. These images continue to inspire nightmarish creatures that wander the streets every Halloween; the tradition of bone-chilling campfire stories; and let’s not forget the psyche-scarring films audiences can’t get enough of. It is a celebration of frightful images, compiled and presented by some of the genre’s most respected names, including a foreword by cult favorite Neil Gaiman. Readers will be ensnared by the shockingly lurid and hauntingly beautiful color photos and illustrations representing every aspect of the horror genre since Bram Stoker’s Dracula and Mary Shelley’s Frankenstein in the 19th century. Vampires, werewolves, zombies, ghosts, demons, serial killers, alien invaders, and more, it’s all here. From early engravings – via dust jackets, book illustrations, pulp magazines, movie posters, comic books, and paintings – to today’s artists working entirely in the digital realm. Stephen Jones and his exceptional team of contributors have sourced visuals from archives and private collections (including their own) worldwide, ensuring an unprecedented selection for those discovering the genre and the most committed fans. The Art of Horror is the ultimate collection to indulge the dark side in everyone. Stephen Jones is the leading authority on the fascinating history of horror. He is a Hugo Award nominee, the winner of four World Fantasy Awards, three International Horror Guild Awards, four Bram Stoker Awards, twenty-one British Fantasy Awards, and a Lifetime Achievement Award from the World Horror Association. One of Britain’s most acclaimed horror and dark fantasy writers and editors, he has more than 130 books to his credit. Applause Books wants to congratulate Stephen Jones for winning an Award for his book The Art of Horror An Illustrated History! Stephen Jones was one of many authors present at the Horror Writers Association’s Bram Stoker Awards ceremony in Las Vegas, which took place this past weekend. He won the prize for Superior Achievement in Non-Fiction! To watch the event, and Stephen Jones’ acceptance speech click on the link below! Amazingly, there has never been a book quite like The Art of Horror An Illustrated History: a celebration of fearful images, compiled and presented by some of the genre’s most respected names. While acknowledging the beginnings of horror-related art in legends and folk tales, the focus of the book is on how the genre has presented itself to the world since the creations of Bram Stoker and Mary Shelley. The stunning illustrations featured in The Art of Horror will captivate you right from the start. With chapters like, The Blood Is The Life, Man-Made Monsters, and Giant Behemoths, Editor Stephen Jones showcases an unprecedented collection of some 400 of the finest examples of horror-related art. Each chapter begins with an overview of the featured area of the genre, and also contains two special features on specific topics (e.g. Bram Stoker’s Dracula, or the paintings of Clive Barker). These 10 chapters also showcases quotes from artists/illustrators, and a selection from writers and filmmakers, are featured throughout. Jones and his stellar team of contributors have sourced visuals from archives and private collections (including their own!) worldwide, ensuring an unprecedented selection that is accessible to those discovering the genre. They also include many images that will be rare and unfamiliar to even the most committed fan. From early engravings, via dust jackets, book illustrations, pulp magazines, movie posters, comic books and paintings, to today’s artists working entirely in the digital realm. It’s all here, from the shockingly lurid to the hauntingly beautiful. Stephen Jones speaks with Exquisite Terror! Stephen Jones, author of The Art of Horror, spoke with Rich Wilson from Exquisite Terror about his inspiration for the book. Read the interview below and let us know your thoughts in the comments below! Read the whole interview over at Exquisite Terror! Stephen Jones, editor of The Art of Horror: An Illustrated History, spoke with Stuart Wright of Britflicks. They spoke about the incredible illustrations that are featured in the book and much more. Listen to the podcast below to learn more The Art of Horror and what it has to offer! The Art of Horror, sneak peek on ISSUU! The Art of Horror An Illustrated History is filled with rare and unfamiliar images, sourced from archives and private collections around the world. Fans of horror and the unknown will enjoy this book and its 10 chapters of themed genres such as, vampires, zombies, demons, aliens, and more. This book has a wide range of topics starting from the history of horror all the way to the development of art and graphic design. It will also become a major source book for collectors and traders of horror memorabilia. For a sneak peek click here. Amazingly, there has never been a book quite like The Art of Horror An Illustrated History (October 13, 2015): a celebration of fearful images, compiled and presented by some of the genre’s most respected names. While acknowledging the beginnings of horror-related art in legends and folk tales, the focus of the book is on how the genre has presented itself to the world since the creations of Bram Stoker and Mary Shelley. Here’s a sneak preview of The Art of Horror An Illustrated History.